UGA has announced 30 football signees for the 2015 recruiting class. Roquan Smith was added on Friday, Feb. 13. 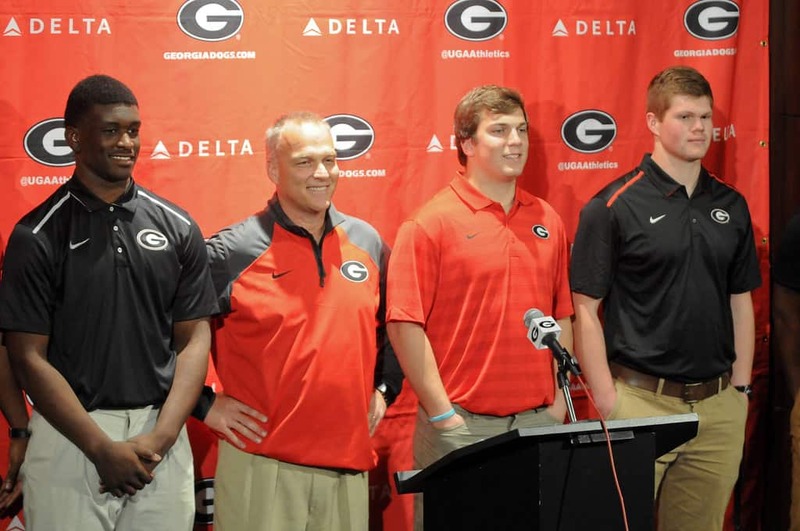 Listed below are bios for Smith plus the 29 recruits who signed with the Georgia Bulldogs on National Signing Day, Wednesday, Feb. 4, 2015. High School: East Marion, coached by Kevin Jackson…2014 MAC Defensive Player of the Year…Named to the 2014 Mississippi-Alabama All-Star Football roster…ESPN.com three-star prospect, #60 ranked athlete nationally, #14 overall prospect in the state of Mississippi…Scout.com three-star prospect, #44 ranked safety nationally, #18 ranked safety in the South region, #3 ranked safety in Mississippi…247sports.com three-star prospect, #35 overall prospect in the state of Mississippi in the composite rankings, #21 safety and #12 overall prospect in the state of Mississippi in 247sports.com specific rankings…Rivals.com three-star prospect, #21 ranked overall player in the state of Mississippi…Enrolled early at UGA to participate in 2015 spring practice…Returned an interception for a touchdown in the Mississippi-Alabama All-Star game…Led East Marion to a 10-5 record and a birth in the 2014 2A Mississippi State Semifinal game…Played quarterback in addition to safety for East Marion…Finished his junior season with 88 total tackles, five interceptions, two forced fumbles and one fumble recovery as well as 1,288 rushing yards, 19 rushing yards, 1,737 passing yards and 21 passing touchdowns…Two-sport athlete at East Marion, three-time varsity player for the baseball team. Personal: JOHNATHAN ABRAM … Born Oct. 25, 1996. High School: Franklin, coached by Anthony Burgos…2015 Semper Fi All-American…Rivals.com four-star prospect, #193 overall prospect in the country, #13 OT in the country, #3 prospect in Maryland…ESPN.com four-star prospect, #210 overall prospect in the country, #19 OT in the country, #2 prospect in Maryland…Scout.com four-star prospect, #217 prospect in the nation, #21 OT in the country…PrepStar Magazine four-star prospect, #250 ranked player in the nation on Top 300 All-America Team…247sports.com three-star prospect #84 OT in the nation, #19 prospect in Maryland…2014 All-State Offensive Player of the Year…Member of 2014 Consensus All-State team…Selected to Baltimore Sun All-Metro first team…Helped pave the way for an offense that rushed for 3,539 yards and averaged 7.3 yards per carry…Helped lead Franklin to a Class AAA state championship in both his junior and senior seasons. Personal: PATRICK ALLEN … Born Feb. 6, 1996. Junior College: Arizona Western College, coached by Tom Minnick…Named to 2014 First Team All-Western States Football League team…2014 Second Team All-NJCAA selection …247Sports.com three-star prospect, #62 overall JUCO prospect, #2 JUCO OLB in the nation, #2 JUCO player in Arizona…Scout.com three-star prospect, #34 JUCO player in the nation…ESPN.com three-star prospect, #5 JUCO OLB in the country…In 2014 he led the Western States Football League with 18.5 tackles for loss and ranked fourth with seven sacks, he also returned a fumble for a touchdown…Played a large role in Arizona Western College’s 11-1 season, in which they finished #5 in the final NJCAA poll…Played as a redshirt freshman in 2013 at Phoenix College…Redshirted in 2012 at North Dakota State. High School: Westview, coached by Jeff Bowen… As a Junior he recorded 86 tackles, 15 sacks, four forced fumbles and two fumble recoveries…Helped lead Westview to a section championship during his senior season with 60 tackles, ten sacks, four forced fumbles, three fumble recoveries, an interception and a blocked punt. Personal: CHUKWU-MA AMAECHI … Born June 19, 1994. High School: Miami Northwestern, coached by Eddie Brown…2015 U.S. Army All-American Bowl selection…ESPN.com three-star prospect, #56 ranked CB nationally…Scout.com three-star prospect, #59 ranked CB nationally, #7 ranked CB in Florida, #22 ranked CB in the South region…247sports.com three-star prospect, #88 overall prospect in the state of Florida in the composite rankings, #45 CB and #55 overall prospect in the state of Florida in 247sports.com specific rankings…Rivals.com three-star prospect, #71 ranked CB nationally…Recorded one tackle in the 2015 U.S. Army All-American Bowl…Helped lead the Bulls back to the playoffs in 2014…Was an all-state track and field performer in the 200- and 400-meter dash during his junior year. Personal: DEANDRE BAKER … Born Sept. 4, 1997. High School: Woodland, coached by Mathis Burnette…Selected to attend Nike’s The Opening by Student Sports…Prepstar 300 player…ESPN.com four-star prospect, #22 ranked DE nationally, #6 overall prospect in the state of South Carolina, ESPN Top 300 recruit…Scout.com four-star prospect, #27 ranked DE nationally, #13 ranked DE in the South region, #2 ranked DE in South Carolina, …247sports.com four-star prospect, #203 ranked player in the country, #13 strong side DE, #3 overall prospect in the state of South Carolina…Rivals.com four-star prospect, #16 ranked WDE nationally, #4 overall prospect in the state of South Carolina… Enrolled early at UGA to participate in 2015 spring practice…Helped lead the Wolverines to a 9-5 record and a third-round playoff appearance in 2014…Named to the South Carolina Football Coaches Association 2014 Palmetto Champions Lower State All-Star Team…Selected to the 2014 South Carolina Shrine Bowl…Tallied 89 tackles, 33 for loss and seven sacks in his junior year…Recorded 45 tackles, including 10 for loss and six sacks, as well as two forced fumbles and two fumble recoveries in his sophomore campaign. Personal: MICHAEL BARNETT … Born July 11, 1997. High School: Thomas Stone, coached by Paul Friel…Washington Post Defensive Player of the Year…Maryland Consensus All-State Team…PrepStar 300 player…ESPN.com four-star prospect, #26 ranked athlete nationally, #6 overall prospect in the state of Maryland, #32 overall prospect in the East region, ESPN Top 300 recruit…Scout.com three-star prospect, #60 ranked CB nationally, #8 ranked CB in the East region, #2 ranked CB in Maryland…247sports.com three-star prospect, #9 overall prospect in the state of Maryland and #37 CB in the composite rankings, #43 CB and #10 overall prospect in the state of Maryland in 247sports.com specific rankings…Rivals.com four-star prospect, #31 ranked CB nationally, #6 overall prospect in the state of Maryland… Helped lead the Cougars to an 11-2 record, advancing to the state semifinals…Registered 27 total tackles and four interceptions, averaging 45 yards per return, his senior season…Played both defense and offense, rushing for 1,408 yards and 22 touchdowns his senior season…Led his region in total points scored in 2014 with 146, ranked second in his region in rushing yeards…Also rushed for over 1,000 yards his junior season, averaging over 120 total yards per game and scoring 16 total touchdowns. Personal: JUWUAN BRISCOE … Born August 3, 1997. High School: Holy Cross (La. ), coached by Eric Rebredo … PrepStar Magazine three-star prospect and PrepStar All-Southeast Region Team…ESPN.com four-star prospect, #39 ranked WR nationally, #15 overall prospect in Louisiana … Scout.com, four-star prospect, #287 overall prospect in the country, #39 WR nationally, #17 WR in the South, #16 overall player in Louisiana… Rivals.com three-star prospect, #21 overall prospect in Louisiana, #60 WR nationally … 247Sports.com three-star prospect, #80 WR nationally, #32 overall prospect in Louisiana … Amassed 45 receptions for 646 yards and 6 touchdowns in 2014, his senior season at Holy Cross… Hauled in 48 passes for 785 yards and six touchdowns during his junior season in 2013 … Also played on the boys basketball team at Holy Cross. Personal: MICHAEL CHIGBU … Born May 8, 1997. High School: Tri-Cities, coached by James Banks … Scout.com three-star prospect, #60 ranked safety nationally, #27 ranked in the South…DawgPost #76 ranked overall player in Georgia… 247sports.com three-star prospect, #60 safety and #87 overall prospect in the state of Georgia in the composite rankings, and #53 safety nationally and #85 overall prospect in the state of Georgia in 247sports.com specific rankings … Two-way player for Tri-Cities, helping the Bulldogs to a 6-4 record … Ran the ball nine times for 222 yards and two touchdowns and also completed one pass for 12 yards his senior season. Personal: KIRBY CHOATES … Born March 1, 1997. High School: Harris County, coached by Dwight Jones … Georgia Sports Writers Association Second Team All-State in Class AAAAA … Named to the Atlanta Journal Constitution All-State Honorable Mention in Class AAAAA … Scout.com three-star prospect … 247sports.com two-star prospect, #269 WR and #214 overall prospect in the state of Georgia in the composite rankings, three-star prospect #221 WR and #181 overall prospect in the state of Georgia in 247sports.com specific rankings … Rivals.com two-star prospect … Saw significant playing time at both WR and RB for the Tigers … Helped Harris County to a 9-4 record, going 6-0 in its region and advancing to the second round of the AAAAA State Playoffs … Rushed for 1,665 yards and 27 touchdowns as a senior, also recorded 204 yards and two touchdowns receiving …Three-year varsity player … Two sport athlete while at Harris County as three-year member of the varsity basketball team…Averaged 15 points and six rebounds per game as a sophomore. Personal: DEQUARTAVIOUS “TAE” CROWDER… Born March 12, 1997. 2015: Transferred to UGA following elimination of the football program at UAB. 2014 (UAB): Ranked first on team in tackles for second season in a row, totaling 70 stops, including 47 solo tackles … Was named second-team All-Conference USA by league’s head coaches after conclusion of regular season … Ranked No. 2 in C-USA in tackles for loss (16.5) and tackles for loss average (1.38) … Was No. 7 in Conference USA in sacks with 6.0 … Recorded season-high 11 tackles at SEC foe Arkansas and had 10 tackles against C-USA champion Marshall … Returned a fumble 56 yards for a touchdown against Louisiana Tech for first collegiate touchdown. 2013 (UAB): Was team leader in tackles with 93, including 58 solo hits … Also paced Blazers in tackles for loss with 8.0 (-21 yards) … Recorded one interception (vs. East Carolina) … Forced a fumble in season opener at Troy … Registered double-digit tackles in three games (Troy, Marshall and East Carolina) … Season-high 13 stops at ECU, with 12 against Marshall and 11 in season opener at Troy … Named to Conference USA Commissioner’s Honor Roll. 2012 (UAB): Played in all 12 games as a freshman and started 10 of those … Ranked No. 4 on the team in tackles with 63 stops, including 36 solo hits … Recorded a season-high 10 tackles in home game vs. Tulsa … Also registered nine tackles in three different games (Ohio State, East Carolina and Tulane) … Finished season with 3.5 tackles for loss and one forced fumble (vs. Tulane) … Notched his first collegiate interception in road game at South Carolina … Named to Conference USA Commissioner’s Honor Roll and also was a recipient of the C-USA Academic Medal (3.6 GPA or higher). High School: Attended Chelsea High just south of Birmingham … Saw action on both sides of the ball for Chelsea but earned most of his notoriety as an outstanding quarterback for the Hornets … Passed for 1,058 yards and rushed for 1,491 yards as a senior … Passed for nine touchdowns and ran for 22 scores … Named the Shelby County Player of the Year by the Shelby County Reporter … also contributed 44 tackles on the defensive side for Chelsea … Helped team reach Class 5A state playoffs … Earned spot on Birmingham News All-Metro Team as Athlete … Named to 2011 Birmingham News All-Shelby Team as an Athlete as a senior … Listed as No. 49 prospect in state by Scout.com and also was named honorable mention all-state by Scout.com … As a junior, he was named honorable mention All-Shelby County by Shelby County Reporter … Passed for 1,673 yards and 16 touchdowns his junior year … Also ran for 1,055 yards and 10 touchdowns … Also a standout on Chelsea basketball team, eclipsing 1,000-point mark for career in January, 2012 … Member of National Honor Society in 2010 and 2011. Personal: JAKE GANUS … Born March 22, 1993 … Major: Business. High School: Callaway, coached by Pete Wiggins …2014 American Family Insurance USA Today All-USA First Team defense….PrepStar Magazine five-star prospect, #14 ranked player nationally, Top 150 Dream Team…Scout.com five-star prospect, #31 overall prospect, #6 WR overall, #4 ranked WR in the South…DawgPost #4 ranked player in Georgia … Rivals.com five-star prospect, #1 overall athlete, #1 overall prospect in the state of Georgia, #10 overall prospect nationally … 247Sports.com four-star prospect, #3 athlete prospect nationally, #7 prospect in Georgia, #48 overall prospect nationally … ESPN.com four-star prospect, #5 ranked athlete in the nation and #7 overall prospect in Georgia … … Named to the Atlanta Journal Constitution 2014 Georgia Super 11… and Class AAA All-State defense …Named 2014 Georgia Sports Writers Association All-State returner for Class AAA …In 2014 he helped lead Callaway to a 7-5 overall record and a 3-1 record in Region 5-AAA … Also played basketball and baseball at Callaway. Personal: TERRY GODWIN … Born Oct. 23, 1996. High School: Marist School, coached by Alan Chadwick … PrepStar Magazine four-star prospect, #243 ranked overall player on top 300 All-America team…ESPN.com four-star prospect, #24 ranked OT in the nation, #27 overall prospect in Georgia … Scout.com three-star prospect, #57 ranked OT nationally, #20 OT in the South…DawgPost #56 ranked player in Georgia… Rivals.com three-star prospect, #50 ranked OT in the nation, #49 overall prospect in the state of Georgia … 247Sports.com three-star prospect, #57 OT nationally, #55 overall prospect in Georgia … 2014 Atlanta Journal Constitution All-State Class AAAA offense … 2014 DCFCA First Team All-Region … Helped Marist finish as runner-up in the region and advance to the third round of the Georgia AAAA state playoffs. Personal: ALLEN “SAGE” HARDIN … Born Sept. 29, 1996. High School: Columbia Central, coached by Howard Stone … Named PrepStar Magazine #225 ranked player nationally in the PrepStar Top 300 All-American… Rivals.com four-star prospect, #9 TE nationally, #10 player in the state of Tennessee … ESPN four-star prospect, #212 player nationally, #5 TE nationally, #8 player in the state of Tennessee … 247Sports.com four-star prospect, #192 player nationally, #5 TE nationally, #7 player in the state of Tennessee … Scout.com four-star prospect, #170 ranked overall player in the country, #6 ranked TE nationally, #2 in the South, #5 ranked overall player in Tennessee…Named to the 2015 Tennessean All-Midstate team … Played in the 2015 Semper Fidelis All-American Game … Gained over 1200 yards receiving and nine touchdowns his senior season for Columbia. Personal: JACKSON HARRIS … Born Feb. 28, 1997. High School: Westlake, coached by Bryan Love… 247sports.com three-star prospect, #30 DT nationally, #56 prospect in Georgia…ESPN.com three-star prospect, #31 DT in the country, #46 prospect in Georgia…Rivals.com three-star prospect…Scout.com three-star prospect, #45 ranked DT in the nation, #14 DT in the South…DawgPost #53 overall player in Georgia… Selected to Region 3AAAAAA first team defense…Atlanta Journal-Constitution Class AAAAAA All-State Honorable Mention … Two-way player for Westlake, playing both offensive and defensive line helping the Lions to a 10-2 record and a perfect 7-0 in their region…In his senior season he recorded 65 tackles, 16 for loss, seven sacks, two forced fumbles and a blocked field goal… As a junior he collected 33 tackles, six for loss, and five sacks. Personal: DaQUAN HAWKINS … Born June 1, 1997. High School: Tucker, coached by Bryan Lamar … Named to the PrepStar Magazine five star prospect, #56 ranked player in the country on its Top 150 Dream Team…Rivals.com four-star prospect, #48 player nationally, #6 player in the state … ESPN four-star prospect, #62 player nationally, #10 DT nationally, #9 player in the state … 247Sports.com four-star prospect, #113 player nationally, #9 DT nationally, #10 player in the state … Scout.com #91 player nationally, #10 DT nationally, #3 ranked DT in the South, #11 player in the state… DawgPost #11 ranked overall player in Georgia…2014 Georgia Sports Writers Association All-State Class AAAAAA honorable mention … Participated in the 2015 Under Armour All-America Game … Helped lead Tucker to a 10-3 record during his senior season, including two wins in the 6A state playoffs. Personal: JONATHAN LEDBETTER … Born Sept. 12, 1997. High School: Barnegat, coached by Rob Davis … PrepStar Magazine three-star prospect and All-East Region…ESPN.com three-star prospect, #50 OT nationally, #8 player in the state of New Jersey … 247Sports.com four-star prospect, #221 player nationally, #24 OT nationally, #5 player in the state of New Jersey … Rivals.com three-star prospect, #53 OT nationally, #15 player in the state of New Jersey … Scout.com three-star prospect, #81 OT nationally, #3 OT in the state of New Jersey … Also played on the defensive line in high school and recorded 15 tackles and six hurries his senior year … Helped his team to the state playoffs all four years of his high school career. Personal: SAM MADDEN … Born June 12, 1996. High School: Randolph Clay, coached by Daniel McFather… Rivals.com three-star prospect, #42 OLB nationally, #53 player in the state … ESPN four-star prospect, #24 OLB nationally, #36 player in the state … 247Sports.com four-star prospect, #24 OLB nationally, #35 player in the state … Scout.com four-star prospect, #204 ranked player nationally, #17 ranked OLB in the country, #4 in the South…DawgPost #18 ranked player in Georgia… 2014 Atlanta Journal-Constitution All-State Class A honorable mention … 2014 Georgia Sports Writers Association All-State Class A honorable mention … Also played basketball for Randolph Clay and was thrice named to the Albany Herald’s Super 6 basketball team. Personal: GARY MCCRAE … Born June 20, 1996. High School: Ensworth, coached by Ricky Bowers…PrepStar four-star prospect, #181 ranked overall player in the country on its Top 300 All-America Team…2014 U.S. Army All-American…Scout.com four-star prospect, #117 overall player in the nation, #17 CB in the country, #6 CB in the South, #4 overall player in Tennessee…247sports.com #145 overall player in the nation, #16 safety in the country, #6 prospect in Tennessee…ESPN.com four-star prospect, #164 overall player in the country, #10 safety in the country, #81 player in the southeast, #4 prospect in Tennessee…Rivals.com four-star prospect #242 player nationally, #17 safety in the country, #12 prospect in Tennessee…2013 and 2014 Tennessean first-team All-Midstate selection…Named to Tennessee Sports Writers Association’s Division II-AA All-State Team…As a junior led his team to a state championship with 875 all-purpose yards, seven touchdowns, three interceptions, five pass break-ups, and 29 tackles…Helped lead Ensworth to a 10-2 record as a senior with 16.5 tackles, 2.5 for loss, three pass break-ups, a forced fumble and a fumble recovery, the Tigers ended the season as state runner-up. Personal: RICO MCGRAW … Born Jan. 24, 1997. High School: Mays, coached by Corey Jarvis … USA Today All-USA second team … PrepStar Magazine #81 ranked player in the PrepStar Top 300 All-American … Rivals.com four-star prospect, #51 player nationally, #2 WDE nationally, #7 player in the state … ESPN four-star prospect, #117 player nationally, #11 DE nationally, #16 player in the state … 247Sports.com four-star prospect, #137 overall player nationally, #9 WDE nationally, #14 player in the state in the state … Scout.com four-star prospect, #134 ranked overall player in the country, #12 ranked DE in the country, # 7 in the South…DawgPost #13 ranked overall player in Georegia…2014 Atlanta Journal-Constitution All-State Class AAAAA defense and 2014 Defensive Player of the Year … 2014 Georgia Sports Writers Association All-State Class AAAAA first team and 2014 Defensive Player of the Year … Played in the 2015 U.S. Army All American Bowl … Recorded 111 total tackles during his senior season, including 27 for loss, leading Mays to a 12-3 record and a berth in the 5A state championship game. High School: Stephenson, coached by Ron Gatrell…Member of Atlanta Journal-Constitution 2014 Super 11 and Class AAAAA All-State Team…Named to the Georgia Sports Writers Association 2014 All-State Class AAAAA First Team Defense and 2013 All-State Class AAAAA Second Team Defense…2014 DeKalb defensive player of the year…2014 Georgia Region 6-AAAAA Defensive Player of the Year…Rivals.com four-star prospect, #74 player nationally, #5 SDE prospect, #10 overall prospect in the state of Georgia… ESPN.com four-star prospect, #12 DE nationally, #17 ranked player in Georgia…247sports.com four-star prospect, #14 WDE nationally, #25 prospect in Georgia… Scout.com four-star prospect, #283 ranked prospect and #26 DE nationally, #12 DE in the South…DawgPost #22 ranked prospect in Georgia… ranked #142 in PrepStar 300…During his senior season he accumulated 99 tackles, 19 tackles for loss, 10 sacks, five forced fumbles and an interception…As a junior he had 108 tackles, 29 tackles for loss, and 15 sacks. Personal: CHAUNCEY RIVERS … Born June 12, 1997. High School: Lakeside, coached by Steve Hibbitts…Member of Atlanta Journal-Constitution 2014 Super 11, in addition to 2013 and 2014 Class AAAAA All-State Teams …Named to the 2013 Georgia Sports Writers Association All-State Class AAAAA Second Team Defense…2015 Under Armour All-American …2013 Region 2-AAAAA Defensive Player of the Year…2013 All-County player of the year…Rivals.com five-star prospect, #33 overall player in the country, #3 ranked safety nationally, #5 ranked player in Georgia…PrepStar Magazine four-star prospect, #53 overall player nationally…ESPN.com four-star prospect, #78 prospect nationally, #4 safety in the country, #13 ranked player in Georgia…247sports.com four-star prospect, #239 overall player nationally, #11 ranked Safety in the country, #23 overall player in Georgia…Scout.com four-star prospect, #239 player nationally, #18 safety in the country…DawgPost #20 ranked player in Georgia…Finished his senior season with 67 tackles and 3 interceptions, two he returned for TDs…As a junior recorded 97 tackles and four interceptions. Personal: RASHAD ROUNDTREE … Born Dec. 9, 1996. Junior College: Hinds (Miss.) CC, coached by Gene Murphy…247sports.com four-star prospect, #19 JUCO prospect nationally, and #5 ranked JUCO OT…ESPN.com four-star prospect, #31 JUCO prospect nationally, #4 JUCO OT prospect…Rivals.com three-star prospect, #33 ranked JUCO player…Scout.com three-star prospect, #40 JUCO prospect. High School: North Gwinnett, coached by Bob Sphire…ESPN.com four-star prospect, #14 ranked OT nationally, #27 overall prospect in the state of Georgia, #124 overall player in the Southeast region…ESPN Top 300 prospect, #259 overall prospect nationally…Rivals.com three-star prospect, #42 ranked OT nationally, #45 overall prospect in the state of Georgia…Fox Sports NEXT three-star prospect, #31 OT in the country…Dawg Post #3 OT and #28 overall prospect in Georgia…247sports.com three-star prospect, #31 ranked OT nationally, #46 overall prospect in the state of Georgia…Helped lead North Gwinnett to an 11-2 record his senior season, advanced to the State Quarterfinals but fell to state runner-up Lovejoy 21-6, ended the season as the fourth ranked team in the state of Georgia…Paved the way for a rushing attack that totaled 1,862 yards and 17 touchdowns for the season, the rushing offense averaged 143 yards per game and 5.4 yards per carry in 2012…Played a large role in North Gwinnett’s 10-2 record and a Region 7-AAAAA Championship his junior season…adopted son of former Georgia All-American and NFL All-Pro Richard Seymour. Personal: DEVONDRE SEYMOUR … Born Jan. 18, 1995. High School: Macon County, coached by Larry Harold … Competed in the 2015 Under Armour All-America Game … … PrepStar Magazine five-star prospect, #61 nationally on it’s Top 150 Dream Team … ESPN.com four-star prospect, #29 player nationally, #2 OLB nationally, #5 player in Georgia … 247Sports.com four-star prospect, #71 ranked overall player nationally, #5 OLB nationally, #5 player in Georgia … Rivals.com four-star prospect, #77 nationally, #6 OLB nationally, #9 player in Georgia … Scout.com #62 ranked overall player nationally, #1 ranked MLB nationally, #1 ranked in the South…DawgPost #6 ranked player in Georgia….Named the Atlanta Journal-Constitution’s 2014 Class AA Defensive Player of the Year … Named the Georgia Sports Writers Association’s 2014 Class AA Defensive Player of the Year….Led team to a 9-3 record and the Class AA playoffs. Personal: ROQUAN SMITH…..Born April 8, 1997. High School: Creekside, coached by Olten Downs … Member of the Atlanta-Journal Constitution 2014 Super 11 … PrepStar Magazine four-star prospect, #164 player in the PrepStar Top 300 … ESPN.com four-star prospect, #156 player nationally, #17 WR nationally, #20 player in the state … 247Sports.com four-star prospect, #234 player nationally, #27 WR nationally, #19 player in the state … Rivals.com three-star prospect, #44 WR nationally, #38 player in the state…Scout.com four-star prospect, #42 WR in the country, #19 WR in the South … DawgPost four-star prospect, #34 player in the state… Missed his senior season due to an ACL injury … Recorded 41 receptions for 817 yards and 16 TDs as a junior … Helped Creekside to the Georgia AAAAA state playoffs his sophomore and junior years, including a state title in 2013 … Played in the 2013 Georgia Rising Seniors All-Star Game, was named game MVP and recorded two TDs for 70 and 47 yards … Also ran track, with a personal best 10.83 in the 100m, and won the Georgia AAAAA 4×100 meter relay in 2013 and 2014. Personal: JAYSON STANLEY … Born April 24, 1997. High School: Hallandale, coached by Dameon Jones … PrepStar three-star prospect, All-Southeast Region…ESPN.com three-star prospect, #44 OLB nationally, #111 player in the state of Florida … 247Sports.com three-star prospect, #37 ILB nationally, #136 player in the state of Florida … Rivals.com three-star prospect, #32 OLB nationally, #69 player in the state of Florida …Scout.com three-star prospect, #36 OLB nationally, #14 in the South, #4 in Florida… Led Hallandale to a 10-2 record, first-place finish in its district and the second round the state playoffs his senior year … Recorded 83 tackles and two interceptions his senior season … Named to the 2014 Broward County All-Star Team. Personal: JUWAN TAYLOR … Born Aug. 13, 1996. High School: Westover, coached by Octavia Jones … Named the 2014 Maxwell Football Club’s National High School Player of the Year … Selected to represent the East in the U.S. Army All-American Bowl … 2014 American Family Insurance USA Today ALL-USA First Team Defense … 2014 USA Today All-USA Defensive Player of the Year … Parade Magazine All-America Team… PrepStar Magazine five-star prospect, #2 player in the PrepStar Top 300 … ESPN.com five-star prospect, #3 player nationally, #2 DT nationally, #1 player in the state … 247Sports.com five-star prospect, #1 player nationally, #1 DT nationally, #1 in the state … Rivals.com five-star prospect, #7 player nationally, #2 DT nationally, #2 in the state … Scout.com five-star prospect, #2 overall player nationally, #1 DT nationally, #1 DT in the South…DawgPost #1 ranked player in Georgia Member of the Atlanta-Journal Constitution 2014 Super 11 … 2014 Atlanta-Journal Constitution Class AAAA Defensive Player of the Year and member of the All-State Class AAAA First Team Defense…During his senior season, tallied 84 tackles, including 36 tackles for loss and four sacks, one interception and one forced fumble … Recorded 148 tackles, 12 tackles for loss, 17 sacks, one interception and one forced fumble his sophomore and junior seasons … Helped his team to the Georgia AAAA state playoffs his sophomore, junior and senior years. Personal: TRENTON THOMPSON … Born July 27, 1996. High School: Langston Hughes, coached by Willie Cannon … Parade Magazine All-America Honorable Mention…2014 U.S. Army All-American … Member of the Atlanta Journal-Constitution 2014 Class AAAAAA All-State Team … Named to the Georgia Sports Writers Association All-State Class AAAAAA First Team Defense … PrepStar Magazine four-star prospect, #236 overall player in the PrepStar 300 All-American… Rivals.com four-star prospect, #85 player nationally, #5 WDE nationally, #19 player in Georgia … Scout.com four-star prospect, #79 player nationally, #7 OLB nationally, #1 in the South…DawgPost #8 ranked player in Georgia… 247sports.com four-star prospect, #165 overall player in the country, #10 WDE nationally, #13 player in Georgia … Finished his senior season with 102 tackles, including 29 tackles for loss and 23.5 sacks … Led team to a 9-2 record and the Class AAAAAA playoffs. Personal: D’ANDRE WALKER … Born Jan. 23, 1997. High School: Tupelo, coached by Trent Hammond…Named to the 201 MAC All-State first-team defense…Named to the 2014 Mississippi-Alabama All-Star Football roster…ESPN.com three-star prospect, #90 ranked athlete nationally, #23 overall prospect in the state of Mississippi…Scout.com three-star prospect, #53 ranked safety nationally, #24 ranked safety in the South region, #4 ranked safety in Mississippi…247sports.com three-star prospect, #21 overall prospect in the state of Mississippi and #61 ranked safety in the composite rankings, #41 safety and #16 overall prospect in the state of Mississippi in 247sports.com specific rankings…Rivals.com three-star prospect, #19 ranked overall player in the state of Mississippi…Enrolled early at UGA to participate in 2015 spring practice…Two-way player at Tupelo, playing wide receiver in addition to safety…Helped lead the Golden Wave to an 8-4 record and a playoff appearance…Registered six total tackles as a senior and also rushed for 275 yards and four touchdowns, adding 118 yards receiving and two touchdowns…Led Tupelo to the Mississippi 6A State Finals where the Golden Wave were defeated 14-7 by Oak Grove…Recorded 359 receiving yards and 343 rushing yards with six rushing touchdowns in his junior season…Two-sport athlete at Tupelo, playing basketball as well during his sophomore season. Personal: JARVIS WILSON … Born Sept. 26, 1996. High School: Coral Gables, coached by Roger Pollard … PrepStar three-star prospect and All-Southeast Region…ESPN.com four-star prospect, #45 WR in the nation, #66 overall prospect in the state of Florida … Scout.com three-star prospect, #62 WR nationally, #11 WR in Florida … 247Sports.com three-star prospect, #58 S in the nation, #87 overall prospect in Florida … Rivals.com three-star prospect, #22 ranked athlete prospect, #61 overall prospect in the state of Florida … Helped lead Coral Gables to a 9-4 record during his senior season. Personal: SHAQUERY WILSON … Born July 3, 1996. High School: Grayson, coached by Mickey Conn … PrepStar three-star prospect and All-Southeast Region…Rivals.com three-star prospect, #32 SDE nationally, #48 player in the state … ESPN three-star prospect, #68 DT nationally, #112 player in the state … 247Sports.com three-star prospect, #42 DT nationally, #87 player in the state … Scout.com three-star prospect, #35 DT nationally, #9 ranked DT in the South…DawgPost #41 ranked player in Georgia …2014 Atlanta Journal-Constitution All-State Class AAAAAA defense … 2014 Georgia Sports Writers Association All-State Class AAAAAA first team … Helped lead Grayson to a 10-2 record during his senior season, including a win in the 5A state playoffs before a loss to Tucker in the second round. Personal: JUSTIN YOUNG … Born June 12, 1997.